And again with the Joss Whedonverse. I have been a fan of Buffy since and even despite of the movie (yes, you can see from the picture that I even own it on DVD!! And you can see my original cinema ticket on the post here). Thankfully the series was much less hammy and got a good run of seven seasons from 1997-2003. I did buy the ‘graphic novel’ type eighth season but wasn’t so keen. I absolutely adore the musical episode – own the separate DVD (even though the episode is in the season boxset) and the Soundtrack. I’m Under Your Spell is a great song and I was pretty impressed with all the singing. The gentleman are one of the freakiest monsters of all time. I used to be able to do their face and scare my sister silly. The fact there is no speaking in most of the episode is impressive and I love the bit where Buffy is miming staking a vampire!!! I’ve seen this in other supernatural series (such as in tomorrow’s C is for… Charmed) but Buffy really nails it with the last shot leaving us wondering is this all a figment of her psychosis. Good Willow playing Evil Vampire Willow – Bored now! I have to give a quick mention to the scene with the Yellow Crayons – makes me weep. In fact I could go on about Buffy all day and don’t think there are many episodes I wouldn’t be happy to watch – though what was with the Cheese man in the season 4 closer!! Are you a Buffy fan? Which is your top episode and why? Have you ever found that you’ve already blogged about something, almost written an identical post and not realised? Posted on April 2, 2013, in April A-Z Challenge, Film and TV Reviews and tagged A-Z 2013, Being Human, Buffy, Joss Whedon. Bookmark the permalink. 15 Comments. I Loved Buffy! I’m not sure I could pick a favourite episode, though I did wonder if they would finally close the series with her having been psychotic all along. I’m glad they didn’t. Also a big fan of Being Human. I need to catch up on the last episodes! Hi Rebecca – it would have been a good, if not satisfactory ending. Also have you seen the US version of Being Human starts on Watch on the 11th April? I’ve only seen the first three seasons of Buffy–simply because there’s so much to watch and so little time! Perhaps I’ll catch up one day. Nothing against the show–it was certainly something different, and tried to push the envelope in terms of ideas. I definitely know what you mean about so much to watch – I have many series saved to watch another time!! Visiting from A-Z Challenge. I am intrigued by your PHD thesis — Creative Writing was the favorite class of mine. The students loved it and I loved teaching it — the ideas just poured out. Not so for my other classes. Hi Natalie – thanks – hoping that the challenge will help with my thesis. Just finalising today’s post now. What age group did you teach? I wonder if it is about freedom and control – with other classes you are being told what to learn, with CW it is often up to you. I like the idea of a Buffy night. My naughty blog put your comment in spam – glad I fished it out and got to read your poems. I like Being Human, but I LOVE LOVE LOVE Buffy. Hush is one of my favorites, too. And I also am a HUGE fan of The Zeppo, where Xander finally sort of comes into his own. 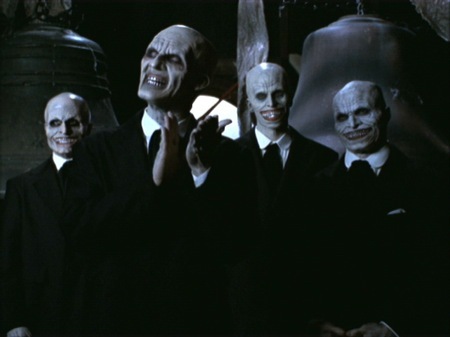 Ahhhh The Zeppo – another great episode – It is odd when I was looking through the episode synopsis for Buffy I could remember most episodes just by the brief run down – not so for Angel. I really, really need to watch Buffy, which I didn’t do when it was still on TV because I was too young. The only reason I haven’t yet is because I know I’ll be hooked and then I won’t get anything done! Just did a quick calculation and you need 100 spare hours or so to watch them all. You really must though, if you plan to watch the film watch it first and laugh and mock! I never watched the show, but I do have it in my Netflix queue to watch. There were occasional episodes I caught. I did attend a sing-along at a convention recently with the Once More With Feeling episode and then Dr. Horrible’s Sing Along Blog, which was fun, so I did see that episode (and sing along with it, ha!). Amber Benson is a keynote speaker at an upcoming writer’s conference. Did you know she was a writer, too? I didn’t! I’ve watched Dr Horrible’s but didn’t ‘get it’ as much as Joss’ other shows. I did know that about Amber but haven’t read anything of hers. Felicia Day also writes I believe.